It will be a hundred years ago tonight, that the policemen surrounded the house at 100 Sidney St and waited all night in the snow with their guns ready. At 3:30am, Detective Inspector Wensley spoke to Mrs Bluestein at 102, and by means of a subterfuge – sending her to request the assistance of Mrs Fleishman, the landlady at 100, with her sick husband – he managed to extricate everyone from the house save the two suspects, sleeping in the front room. At dawn, Wensley threw some pebbles at the window to wake them but received no response. Then, as he was collecting more pebbles, there were six shots from the upper floor and Sergeant Leeson was shot. “Mr Wensley, I am dying. They have shot me through the heart. Goodbye. Give my love to the children. Bury me at Putney.” he said. A bullet had passed right through Leeson’s chest and come out the other side. Once a doctor arrived and Leeson was placed upon a stretcher, it became imperative to get him to hospital, but shooting began again and the doctor was grazed upon the temple by a bullet. Wensley took refuge in the gutter where he lay in the freezing slush for half an hour as the firing continued.When the shooting ceased, Wensley ran back to Arbour Sq Police Station. It was obvious that the police with their antiquated rifles were outgunned by the semi-automatic pistols used by the shooters, so he rang Scotland Yard for assistance. Winston Churchill, the Home Secretary, was enjoying his morning bath when he received the message from Scotland Yard, requesting authority to bring in troops from the Tower of London. 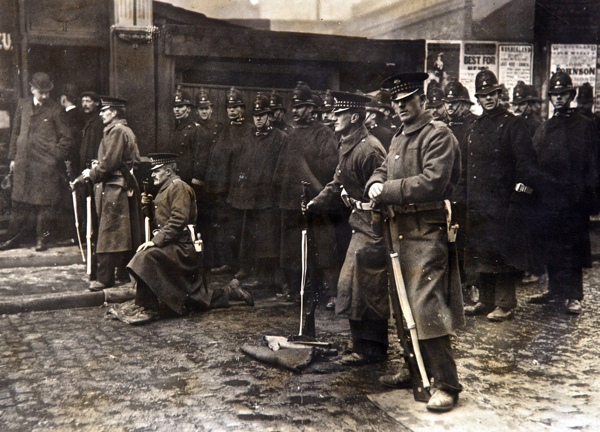 Two officers of the Scots Guards and seventeen soldiers with rifles were dispatched from Tower Hill to join the two hundred policemen already in place, surrounding the two unknown suspects firing from 100 Sidney St. And they were given authority to use any force necessary to resolve the situation, including the use of the Maxim gun that was deployed. Although he had arrived as an observer, Churchill became part of the discussion about whether to storm the house but at one o’clock, before any decision was made, flames were seen at 100 Sidney St. From a nearby rooftop, a reporter saw a gas jet burning on the first floor, suggesting that the fire may have been a attempt to create a diversion, permitting the desperadoes to escape from the back of the house. Ashes of scraps of paper rose in the billowing clouds of black smoke and drifted over the excited crowds. One gunman leaned out of the window, possibly to take breath, and he was shot in the head, then the other – a burning figure – climbed onto the window ledge, to a gasp of horror from the crowd of thousands. Within seconds, after a burst of shots, he fell backwards into the room, and quickly the fire consumed the house, as the roof and floors came crashing down amongst a roar of flames. When a policeman kicked open the door and firemen entered to explore the smoking debris afterwards, they discovered a headless body with the legs burnt away which had fallen from the floor above. 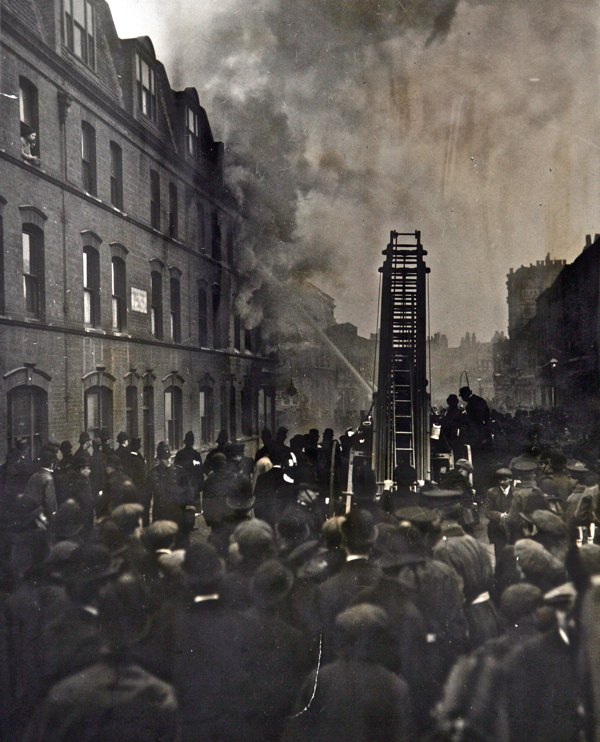 Then part of the sidewall collapsed upon five firemen, killing one of them who died of his injuries the following July. Yet by the evening of that day, they found the second charred body, still with his pistol but with his head also missing like his comrade. Although these corpses were unidentifiable, on the basis of the landlady’s testimony, they were named as Fritz Svaars and William Solokoff. No trace was ever found of the legendary Peter the Painter, to whom – in popular lore – is commonly attributed the masterminding of the gang’s activities. If he existed, he remained at large. A century later, scholarly controversy over his true identity continues and recently Tower Hamlets Community Housing named two new housing developments in Sidney St as Peter and Painter houses. An eleven day trial of the five suspects in custody commenced in May 1911 but, with only fragmentary evidence, they all had their charges dropped, were acquitted or had their convictions quashed. And the judge drew the convenient conclusion that those who fired the shots killing the three policemen upon the night of 16th December 1910 in Houndsditch were the three dead members of the gang. It was an appalling episode in the violent history of the East End, but it proved to be a mere tremor of the coming earthquake that erupted as the First World War on July 28th 1914. Watch news footage of the siege of Sidney St by clicking here and here, and the fictional scene from Alfred Hitchcock’s “The Man Who Knew Too Much,” inspired by these events, is here. You may expect an epilogue to this tale shortly. 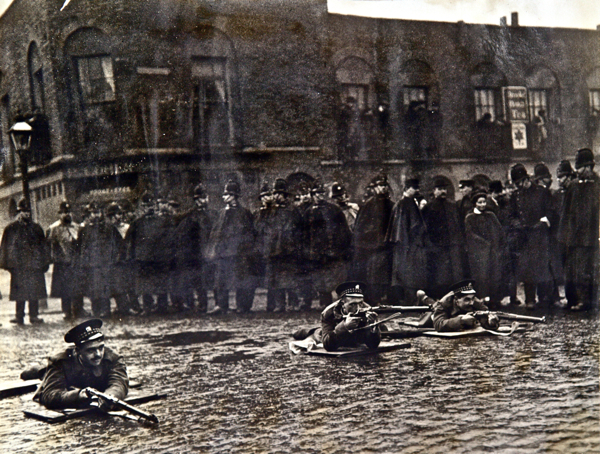 Soldiers of the Scots Guards take up positions. 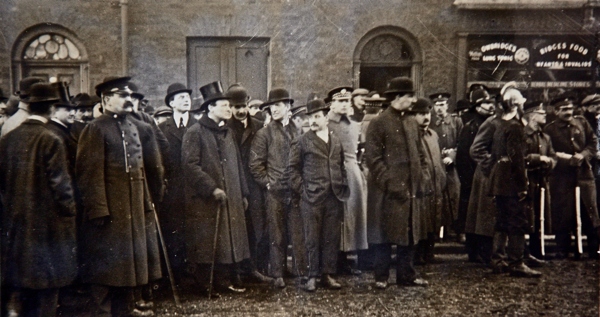 Churchill in his top hat and astrakhan coat stands to the centre left in the crowd. 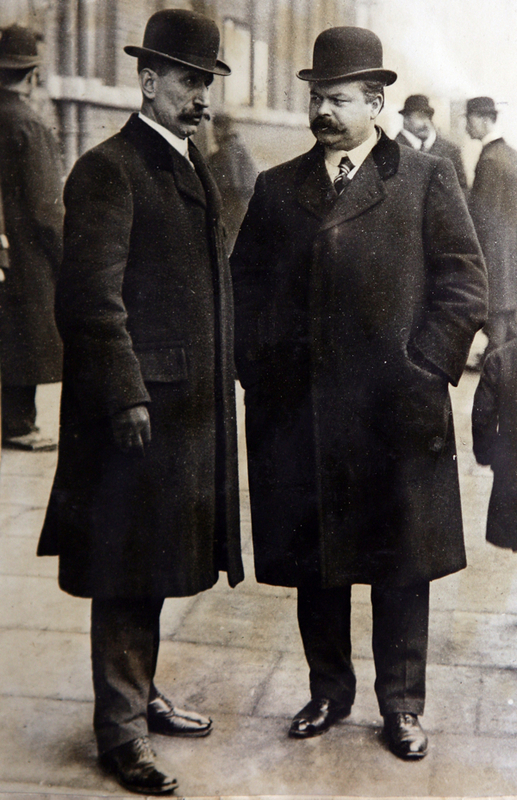 Detective Inspector Frederick Wensley (left) in conference with Chief Detective Inspector John McCarthy. Churchill & the Anarchists, a free exhibition (including many artifacts and pieces of evidence from the case) runs at the Museum of London in the Docklands until April. Look at the amount of people standing around in the ‘conflagration’ photo. There is even a couple looking out of the upstairs window four doors away from the fire! Can you imagine the same scene today? Everyone living within half a mile of an incident like this would be evacuated to the nearest school hall to be supplied with tea & biscuits by the Red Cross for the duration. We all love a good blaze and a shoot-out. Grrr, damn that Health & Safety. But who removed the heads from the bodies and why? Really enjoy this. Great photos and story. I say, “let the buggers burn”! Always a joy to come by here! Loved the post about the milkman and the George. Amazing to see how many wooden balustraded balconies there were back in the days. Saw a picture of you on someone else’s blog but I haven’t told anybody! It is interesting to note that the guardsmen’s rifle slings are blancoed bright white. Peter the Painter – I recollect a radio 4 programme about the Sydney Street Riots, one of the contributors said that Peter the Painter went to live in Australia and died in the 1960′s. That aside, another good post, I like the then and now photo’s. Don’t believe everything you hear on Radio 4, Avis! My grandfather was a cub reporter on this case , would be wonderful if anyone has any information about him, his name was Robert Francis Fitzpatrick. My greataunt Lydia Dubock was supposed to have witnessed this as a child and reportedly had her photo taken peering between the legs of a policeman – would love to know if that is true! My Grandfather had a Ship chandlers/Grocers shop in Sidney Street. My mother remembers hiding in the back room of the shop and that her father could not return home as the police had blocked access. For them it was not a pleasant occasion! Yes, and trauma counsellors would be called in to help everyone on their “journey” of psychological healing.